When the savings in time and space are converted into financials the benefits can be huge. Flat bed and curtain-side trucks no longer have to be parked with 5 m of space either side for loading / unloading. This saves up to 50 % of yard loading area. Single-side loading is faster as this unique forklift travels less. And safety factors are improved because forklift work zones can be separated completely from pedestrian areas. There are many possibilities depending on specific site requirements. Because there is no vertical mast in front, the operator has an unrestricted view ahead, improving visibility, speed of operation and safety. With no mast fork carriage rotation is increased to 111 degrees. This concept alone opens up a huge range of new possibilities in industrial FLTs. Most importantly, attachments can be changed easily and in less than 30 seconds. This presents the potential for big financial savings on some sites as one Teletruk and several attachments can do the work of several other single-function machines. The financial values can be calculated not only in time savings but also in reduced fleet operation costs. To achieve maximum use of attachments such as shovels and grabs particularly in such as recycling sectors four-wheel-drive is available. 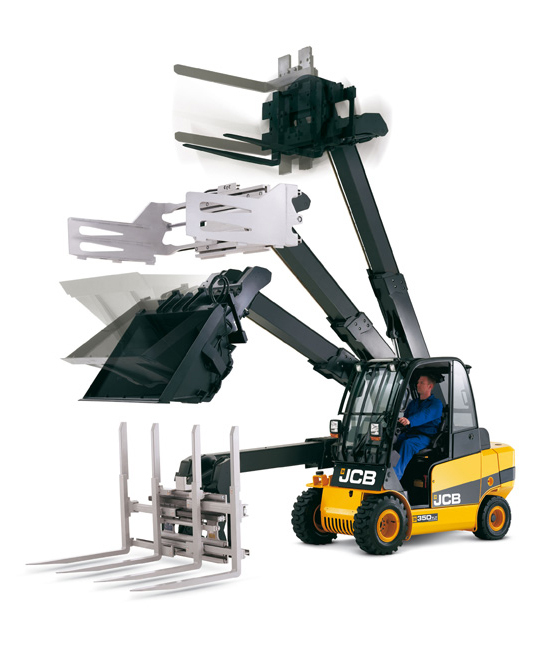 This is unique in the industrial counterbalance forklift world and allows the Teletruk to work in ground conditions which are unsuitable for conventional 2WD masted forklifts.